Yes, school classes are able to set up fire station tours, as well as fire education classes. Please call the Fire Chief / Semmes Fire and Rescue Office at 251-206-7565, for scheduling information. Is it Possible for a firefighter to speak at our event or function? Yes, it’s possible for a firefighter to speak at your event or function. For scheduling information and to discuss topics you’d like to go over, please call the Fire Chief / Semmes Fire and Rescue at 251-206-7565. The Fire Department Helped me out recently, How can I thank the Firefighters? To let the Fire / Rescue Department know how they’re doing, you may call or mail in thank-you notes. Citizens may also send feedback concerning the firefighters by visiting the Human Resource Department on this website. 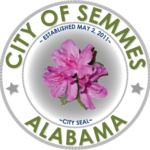 A form is available for this purpose in the Human Resource section of the City of Semmes website and comments will be directed to the Mayor’s attention from this page. Do Firefighters save animals stuck in trees? No, the Semmes Fire / Rescue Department refers calls to the Mobile County Animal Shelter. How do I report a fire code, or safety issue? To report a fire code, or safety issue, please call the Fire Chief at Semmes Fire and Rescue at 251-206-7565. Safety issues can also be reported by citizens on a form located under the section of the website, Fire and Rescue-Report Hazardous Conditions. May I contact the Fire Chief directly with an anonymous safety concern? Yes, you may call the City of Semmes Fire and Rescue with an anonymous safety concern at 251-206-7565 or you may report it on the form provided, Report Hazardous Conditions located on the website. If your concern is an immediate threat to your safety, please call 911. Does the Fire Department perform home safety surveys? No, Semmes Fire and Rescue does not perform home safety surveys at this time, however they will provide and install smoke alarms-(up to three),in your home if requested. Please call City of Semmes Fire and Rescue at 251-206-7565, to schedule a visit if you need alarms. Why do fire engines respond to car accidents, even where they do not look serious? It’s protocol for fire / rescue personnel to respond to the scene of every accident for a number of reasons. Automobile accidents present other hazards such as potential fire, ruptured fuel tanks, undeployed airbags, and/or the presence of hazardous materials. Also, if any occupants are trapped, fire / rescue personnel will begin the extrication (removal) process. How much does the firefighter's gear weigh? A firefighter’s gear can weigh up-to 75 pounds. The basic gear includes a helmet, hood, pants, coat, gloves, and oxygen tank. Depending on what the situation dictates, more equipment may be necessary. What kinds of fire extinguisher should I buy for my home? The best type of fire extinguisher to purchase for your home would be an ABC-rated extinguisher. Fire extinguishers with this rating are effective against fires involving trash, wood, paper, liquids (cooking oil, gasoline, paint), and electrical equipment. Note: Fire extinguishers need to be serviced once a year to ensure it will operate when needed. It’s highly recommend that you purchase a serviceable-type, 5lb ABC fire extinguisher from a certifiable fire extinguisher company. Serviceable-type fire extinguishers are the most reliable since they are guaranteed to work, when maintained properly. They are also refillable, should you ever need to use your fire extinguisher. No, burn permits are not required for residents that live within the Semmes Fire and Rescue fire jurisdiction for small fires. However, any area to be burned more than one acre in size must be approved by Alabama Forestry. Alabama Forestry will issue burn permits for individuals/citizens for these larger planned fires. They can be reached at 251-649-1380. When is the burn season? Under Alabama Department of Environmental Management (ADEM) regulations, open burning is not allowed between May 1st and October 31st each year. Are Fireworks legal in Semmes? Yes, fireworks are legal within the city limits. Is it true that having a fire training facility in Semmes can lead to lower homeowner’s insurance costs? The answer is yes, because it contributes to a lower ISO rating. • If I request medical help in Semmes will I get charged? The Semmes Fire and Rescue Department never charges for Medical Services. These services are paid for through the use of taxes collected by the city. You will incur a charge from the ambulance company that transports you to the hospital.